Search Engine Optimization (SEO) is a key part of any web site to drive and promote traffic, and not just any traffic, the most relevant traffic possible. All our sites are built to be search engine friendly, and we work with all our clients to achieve the best possible results. Many companies make sweeping promises of first page listings but these are generally overly expensive services and produce short-term results. The sites we produce are optimized to take advantage of natural free listings which are a more sustainable, cost effective solution. If you feel your site is not achieving the results you expected we would be happy to take a look at no obligation. The most effective search engine optimization considers the entire online strategy and not just the company website. 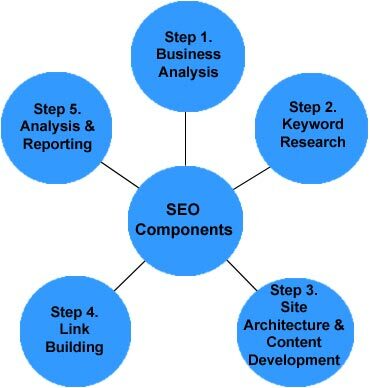 A solid search engine optimization plan should include five major components: (1) a complete business analysis, (2) keyword research, (3) logical site architecture and content development, (4) link building, and (5) analysis and reporting. SEO begins with looking at the business you are in and what customers might use to find you. The next critical piece of SEO is choosing keywords. If you don't do keyword research, your content will lack focus and search engines won't know where to position your website in their index and in relation to the terms for which your customers are searching. If your website lacks content, you won't get the critical links that are required to improve your search engine ranking. Content is king on the internet. We will work with you on writing your content. If you don't know which keywords to target, you can also forget about pay per click (PPC) advertising. For example, if a website owner were to run a PPC campaign but didn't optimize the landing pages, the campaign could quickly turn into a fast way to lose lots of money. Above all, if that website owner doesn't capture metrics to gauge the success of the website in relation to the PPC campaign, he or she is isn't learning from what customers are revealing through their actions on the site. Enhancing your website so that it ranks well in the search engines for targeted key phrases is the essence of search engine optimization. You will achieve high rankings only when all of the SEO components work together seamlessly. Business Analysis: This stage involves us getting to know your business. It also involves you completing our Gathering Requirements Questionnaire which will help us understand you business and web site needs. Keyword Research: This stage involves specific keyword research with a goal of identifying the most effective keywords for your website to target. When you have the count of the most popular keywords, you can then begin building your content around those certain keywords or keyword phrases (targeted keywords). Competitor Analysis: To be successful in your SEO project, you must understand your competition. They wouldn't have gotten where they are today without implementing specific SEO strategy and tactics. We find out why your competitor's websites are ranking well in your particular industry and apply the methodology to achieve similar results for your website. Analysis Of Your WebSite: Now it's time to get your site up to par in all of the critical areas including content, aesthetics, navigation and optimization for search engines. Many marketers don't understand why their sites don't rank well for the keywords and quite often, it's because their content is relevant. All of the critical SEO elements must be working together simultaneously. Link Building: Link building is one of the most important factors in getting top placements on the major search engines. A large number of quality links has a very positive effect on search engine ranking. Are you serious about maximizing the potential of your website? Contact Fab Web Designs today to discuss a customized search engine optimization strategy designed to grow your online business. Search MSN using Mountain View Landscape: The web site came in at positions #2, #3 and #4 out of 451,356 references. Search Google using Mountain View Landscape LLC: The web site came in at positions #4, #5 and #6 out of 1,420,00 references. Search Yahoo! using Cardiac Surgical Associates: The web site came in at position #1 out of 347,000 references. 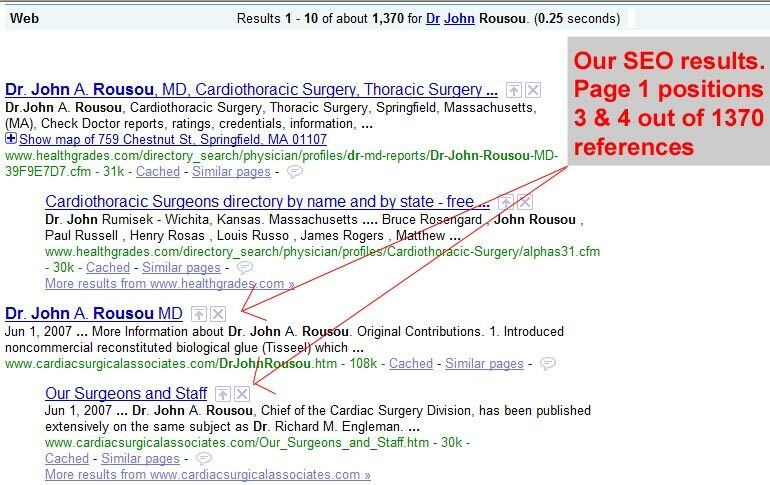 Search Google using Cardiac Surgical Associates: The web site came in at position #4 out of 1,470,000 references. Search MSN using Cardiac Surgical Associates: The web site came in at positions #1 and #2 out of 96,338 references. The 12 Biggest Search Engine Optimization Mistakes. The vast majority of websites haven’t got a clue about keywords. If you don’t know what words your potential customers are using in search engines to try and find a business like yours, then it’s hardly worth while having a website. We’ll work with you to develop your keywords and place them in the back-end area were Search Engine’s can find them and in the content on the web page. This free-to-use research tool should be experimented with to determine the single best keyword phrase for the most efficient optimization of your home page. It’s extremely tempting to research the most commonly searched for word in your industry, and then optimize your website for that word in an attempt to attract as many website visitors as possible. An important factor to bear in mind though is that thousands if not millions of websites in your industry will be competing for those single keywords. The trick is to aim for your website to be on the top page of search results for Google, Yahoo and MSN search results for a keyword phrase that is moderately popular for your industry. How to choose the right keyword phrase. Your chance of appearing in the top page of search engine results is greatly enhanced if you focus your website optimization efforts on two or three-word phrases instead of single words. But how do you choose the right keyword phrase? Your page title on your home page is the biggest indicator to search engines of what your website is about. If it doesn’t succinctly explain exactly what your website offers, as well as containing your keyword phrase as discussed in Search Engine Mistake #1, then you’re missing out significantly on website visitors. The web page description can be found in the Meta Tag section of the page header. This is a section that is commonly missed out or not used to its full potential. This web page description is used by search engines to provide a description underneath the clickable page title link in their search results. This relates back to number #1. You must have effect keywords and your web site designer has to know where to put them in what’s called the HEAD section of your web site. This is hidden to normal users, but not to Search Engines. Also the Keywords should be listed at least two time within the content viewed by the readers. H1 Tags were originally introduced to aid the formatting of HTML documents. They literally mean ‘Heading Size 1’ which is generally the biggest sized font used online. However, because their presence indicate a page heading with larger text, many search engines have decided to count this as a significant part of the ranking that deems what the page content is about. It is therefore recommended to feature your main keyword phrase for that page in the heading and not just a picture. This page uses the H1 tag. ‘Alt Tags’ – short for Alternate Tags were originally designed to contain the text to be displayed on web pages instead of images if a user’s computer did not have the capability (specification) to be able to display images. However, as time has gone by, nearly all computer monitors now have the capability of displaying images. This has meant that some web designers have decided to forget about adding Alt Tags to their images. Big Mistake! Alt Tags are another keyword tool. Title tags have a similar functionality to Alt tags but can also be used to add a more comprehensive description to a text link. It is generally good practice to use both alt and title tags with images. Many webmasters know that the wording within a website address is important when it comes to getting your keywords right. The website address (also known as URL or file name) is something that search engines ‘read’ among other things to determine the content on the web page. However, just because many webmasters know that something should be done, doesn’t mean that it will be done. We make sure that your keywords are included in the URL as much as possible. You can have the prettiest looking website in the world which is extremely user friendly, offering everything your prospective customers are looking for – but nobody can find it. Search engine have decided that it isn’t important enough because it doesn’t have enough raw text based content. Now and for the foreseeable future content will be king on the Internet. This means that is your website is too Macromedia Flash or Image heavy, then search engines will tend not to rate it as highly as other similar genre websites with more text based content. You’ve spent weeks getting your website design right. Your website is fully ‘optimized’. Or so you think. Why are visitors not finding your website? You’ve probably forgotten to optimize your content by adding keyword phrases! You should know by now that you need to have a few hundred words of text based content on each page of your website to attract search engines and help search engines determine what each page is about. What you need to ensure is that your keyword phrase is included TWICE in your page content. We are not talking within any navigational menus. Your keyword phrase needs to appear, uniquely, twice, and on just the one page. Ideally at the start and the end of each portion of page content. Note: This does not include other previously discussed areas in which to house keyword phrases such as the page title tags or the page heading. The final one of the 10 biggest search engine optimization mistakes can effect whether or not search engines find every page on your website, how they interpret the relevance of each page, and how they rate the value of each page. Navigation is the way your users can find their way around your website. Generally, website have their navigation links to the top or side of each web page – and each web page has the same navigational look and feel. Unfortunately, many website navigation menus are image based. This means that search engines often won’t ‘spider’ the linked pages as reliably as they do with text based menu links. You can get around this by some degree by adding ‘alt tags’ to your images as previous discussed, but it’s never quite as predictable for effective search engine spidering as plain old text. What if I don’t like the look of text navigational menus? It doesn’t matter if you want to keep your existing image or ‘flash’ based navigational menus though. The secret for appealing to both your users and search engines is to use both navigational methods. But they don’t have to be next to each other. Your text based menus can be at the bottom of each page – your website users don’t have to use them. Google has a patent on its’ Search Engine technology. One item they give higher scores to is URL’s registered for 5 or 10 year period. The reason for this is that email Spammers typically only register sites for 1 year then move on to a different domain name. The cost to register a domain name for a 5 year period is around $45. Search Engines place a big emphasis on cross-linking. If one or more sites link to your site then the Search Engines give you credit for being a valid site. The more cross-links you have the better. But some design firms use what are called Link Farms to provide cross-linking. This is view very negatively by Search Engines and can even get your site black listed. We never request your site gets listed on a Link Farm and we manually request your URL be linked to on good sites. We would also like to mention that if someone is kind enough to link to your site, we might link back to them if relevant.